PHOTO BY JEFF FASANO Brothers Dave and Phil Alvin formed The Blasters in the 1970's, but went their seperate ways in the 80's. The brothers are back together and recently released the blues album "Lost Time." "Your brother's dead," the voice said on the other end. "I was in California," Dave says in the present day, remembering that phone call. "And he was in Spain. It was like 45 minutes to an hour of darkness until I got another phone call saying, 'He's in a coma; he's alive, he's going to be okay.'" Dave and his brother, Phil, had been somewhat estranged and for the most part hadn't worked together for 30 years. It took his brother's temporary death to get them back together. "He died," Dave says. "And was brought back to life. In that almost hour period of mourning, I was regretting things we hadn't done. And as trivial as it sounds I regretted that we hadn't recorded things like 'Cherry Red Blues' or all the Big Bill Broonzy songs we grew up loving. So when I got the phone call saying he's going to be alright, that set everything in motion in my brain. 'Let's put everything aside — solo careers, this, that, and the other — and let's just make some friggin' music together.'" The resulting Dave Alvin and Phil Alvin record was last year's Grammy- nominated "Common Ground," a collection of Big Bill Broonzy tunes the brothers had listened to while growing up. And to make up for lost time, the brothers have just released its follow-up, "Lost Time": another collection of music they loved from their days growing up in Downey, California. 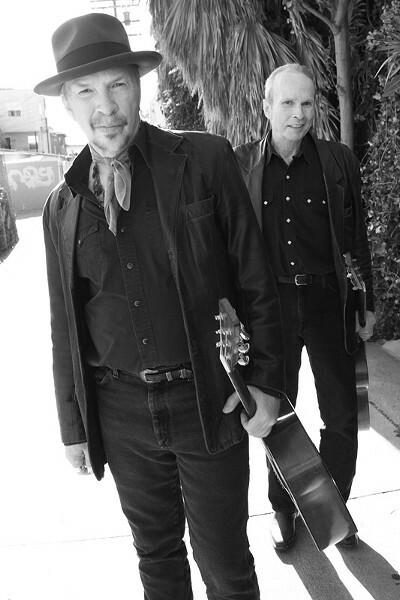 Dave and Phil Alvin founded The Blasters in 1979. The band was incendiary, mixing various high-energy styles with a driving back beat and bravado. The Blasters simply called it "American music." It was a magnificent amalgam of blues, R&B, rockabilly, rock 'n' roll, and roots-rock. The band made its mark in the burgeoning LA punk scene along with bands like X and Black Flag. As kids, the Alvin Brothers were infatuated with the blues and hung around blues clubs to see legends like T-Bone Walker, Big Joe Turner, and Sonny Terry, to name a few. As The Blasters, they got to rub elbows with legendary saxophonist Lee Allen (of Lloyd Price, Fats Domino, and Little Richard fame) who wound up joining the band. Dave left the band in 1986 to pursue a solo career while Phil continued on with The Blasters and solo work of his own. The brothers wouldn't work again until that phone call. So Dave and Phil Alvin are back. It ain't The Blasters, but it kinda sounds like it. Dave doesn't necessarily disagree. "At times it does," he says. "I mean, it is the Alvin Brothers, so it only makes sense to sound a little like a Blasters record." Though Alvin concedes some of this record could have been done with The Blasters, it wasn't what he and his brother were aiming for. "The issue with The Blasters is," he says, "The Blasters is a band and it was known for certain things. And I didn't want that sort of heaviness, I just wanted to make an Alvin Brothers record. Because, if you include the band members, there're five different opinions. The Blasters was always a democracy. Everybody had an equal say in everything. And I just wanted to make some records where just the two Alvin brothers have a say." And where they could make up for lost time. Hell, it's the album's title. "It's sort of a play on having not made a record in 30-odd years," Alvin says. "It goes back to the five years we were in The Blasters. It really goes back to childhood; the back cover of the album is a picture of us as teenagers with Big Joe Turner, Hoppy Hopkins, and you know, that time is lost. A lot of our adopted brothers are gone, some of our closest friends are gone. So it all kinda ties in with there's a lot of lost time. "And it's not just the time we didn't spend making music together, just time in general. We did four Big Joe Turner songs on the record because we wanted to capture a little bit of Big Joe." Big Joe's influence was all over The Blasters. Ditto for the brother's new project. Turner showed Phil Alvin how to sing when he was 14. Nobody comes closer to Big Joe Turner's Kansas City shout and bluesy bellow than Phil. With so much referential and reverential history going in and coming out of "Lost Time," it's hard to classify it. Is it rock 'n' roll? Is it blues? Is it Americana? "It's a blues record," Alvin says. "Blues to me is a pretty broad definition. Blues doesn't necessarily sound one or two ways. There's a million ways to play the blues. Muddy Waters played it one way; Big Bill Broonzy played it another; Miles Davis played it another; The Allman Brothers, Bob Wills and his Texas Playboys, played it another way. It all boils down to the form, but I always considered The Blasters' and my own solo records as blues records." Front to back, "Lost Time" is a beautiful record. It's the Alvin Brothers saluting their heroes. There're the four songs by Big Joe Turner as well as songs in the public domain, and stuff by James Brown, Willie Dixon, and so on. The playing is interpretive yet appropriate. Phil bellows and wails while Dave's guitar slithers and stings. It's infectious, irresistible, and menacing. "Selecting the songs was easy," Dave says. "They're just songs we've always loved. We picked songs we'd sung or loved all of our lives. Songs like 'Cherry Red Blues' and 'Hide and Seek.' The biggest problem we had was a lot of the great blues material from the early 60's backwards has been done so much, so many times by so many artists. The world doesn't need another version of 'Hoochie Coochie Man.' 'Sweet Home Chicago'? No thank you." Though the man is making up for lost time, Dave hasn't made any plans for record number three with his brother. "I never make plans until it's time to make them," he says. "The only plan I've made is 'Hey I wanna quit my day job.' And I've managed to stay away from that day job for 30 some years. So it's working on some level." When pressed about the Alvin Brothers' legacy, Alvin laughs. One hundred years from now, what will they say about Dave and Phil Alvin?